The installation incorporates notions of multiple possible universes, the queerness of asymmetry, and the interaction of human inquiry-- themes common to theoretical physics. 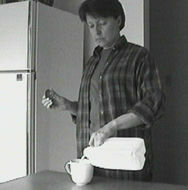 The video shown on the left monitor is of a rather unremarkable scene: a woman enters a house, walks to the kitchen, opens the refrigerator, gets some milk, drinks some milk, replaces the milk, and leaves the room. The video on the right is the exact same scene--only mirror-imaged-- with a few subtle details different from its counterpart. 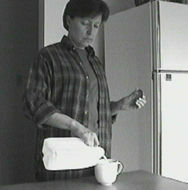 For example, the amount of milk in the jug. A man walks by an open doorway in the background. Simple, subtle, seemingly inconsequential things. The interface knobs allow the user to manipulate the respective videos, forward and backward. For each type of a piece of matter, there is a corresponding opposite type, i.e. each particle has its anti-particle. The proton has the anti-proton, the electron its positron, etc., allowing one, theoretically, the ability to build a "mirror-image" replica of any given atom, any given chunk of matter. Placing a representative of each of a pair of these particles in the same space effectively annihilates both, equally. But all is not so symmetrical. At the beginning of our cosmos, during the Big Bang, things tended towards what we consider matter, effectively omitting the corresponding opposite, anti-matter, from possibility. Why this is, our scientists do not know and our philosophers can only ponder. Anti-Matter can be made, in super colliders, for short periods of time, but it is not regular in our reality. "Two Possibilities" allows us to examine a matter universe and an anti-matter universe side-by-side and see if we can find any clues to this riddle. The conception of this piece owes credit to Timothy Chupp, University of Michigan Physics Department, for his consultation, and to the Fermi National Accelerator Laboratory, especially Dante Amidei, Eric James, both of the UofM Physics Department, and the University of Michigan School of Art and Architecture, without whom our recent visit would not have been possible. debuted at The Inaugural Conference of the Michigan Center for Theoretical Physics, May 21-25 2001.
accompanied by a report about our visit to Fermi National Accelerator Laboratory.